Here's an encouraging article about a woman who is making rapid and sudden gains in her recovery - 17 years later! Work with what you have whenever you can. Near and dear to my mind are the benefits of standing. Research indicates that standing is healthy for everybody, leading to trends such as the standing desk. Many sites such as EasyStand and JustStand.org provide informative research and links. Being upright is especially important after long times of sitting or lying down, when blood pressure variations can be a serious and even lethal problem. This is why rehabilitation after a spinal cord injury (SCI) begins with learning to sit up again, then moving to tilting tables or standing frames as possible. So why this is near and dear to me? Released from rehabilitation, I had been told to expect nothing significant beyond some slight hip movement. Personally, my progress looked like it was grinding to a now-or-never halt when therapy stopped. Nerve and back pain, living logistics, and muscle memory were all big factors in looking for ways to be on my feet. Trial-and-error included everything that seemed remotely feasible: pulling up against a stool, standing supported against the edge of a couch, etc. Well, everything but the kitchen sink - that came on Jan. 1, 2014, when I began propping up against the counter with pillows and holding on. The first time lasted for four minutes, with increasing amounts in daily intervals, growing to fourteen hours by that spring. Hardly an easy or perfect solution (not for osteoporosis anyway; more on that another time), and probably not recommended - but it helped me, and I was regaining muscle control and taking supported steps by the end of it. And by the summer, my knees were occasionally holding me up unsupported. Recurring disclaimer: This site is never intended to give medical advice or claim that the kitchen sink is a standing frame to replace other techniques. 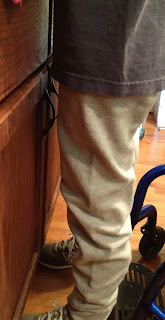 Standing with braces has also been a great part of my recovery (see video links below). These posts are about sharing my story and encouraging others to think outside of the box for ways to pursue mobility and health. Brainstorming, like standing, has its benefits! 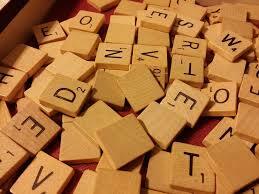 Playing Scrabble to pass a cold January evening? Here’s a word to pick up at least 25 points: poikilothermia (that’s 3+1+1+5+1+1+1+1+4+1+1+3+1+1). The first half comes from the Greek word ποικίλος (-η, -ον; poikilos). Among other things, it means “various,” “changeable,” or “manifold.” Related to the Greek θερμός (-ή, -όν; thermos), the second half means “hot” or “warm.” Put the two parts together and you have a reference to variable body temperature, a medical issue often to be associated with spinal cord injury. Poikilothermia is one of the lesser-known side effects of a disruption to the nervous system and its signals. Essentially, it’s the inability to regulate your own body temperature. Depending on the level and severity of a spinal cord injury, it can mean that your body may not be able to sweat and cool down on a warm day. On the other end of the scale, piling on blankets in front of a heater might not be enough to combat chilly weather. Poor regulation of body temperature is no laughing matter, since a serious case may potentially lead to hypothermia or hyperthermia. It also can be unpredictable and isn’t always linked to the reading on the thermometer! People have different ways of fighting poikilothermia. A quick search brings up a lot of ideas, but here are some tips. For another Scrabble tip, convert the word to poikilothermic. What is a spinal cord injury? Here are some basic statistics and background information on what a SCI looks like and where it occurs. Take a look at this article's image of the intricate nervous system. An injury to the spinal cord affects much more than most people think!